There was a lovely press release this week from Aaron Wudrick of the Canadian Taxpayers Federation warning us all that if we wanted to read the Income Tax Act before next week’s April 30 filing deadline, we’d better get started. And we’d also better plan on doing nothing else, including sleep, over that time—although it would be very hard not to fall asleep: there’s not a lot of suspense to the Act. As a handy CTF infographic shows, the 2018 version of the Act is 3,302 pages long and runs to 1,101,499 words. 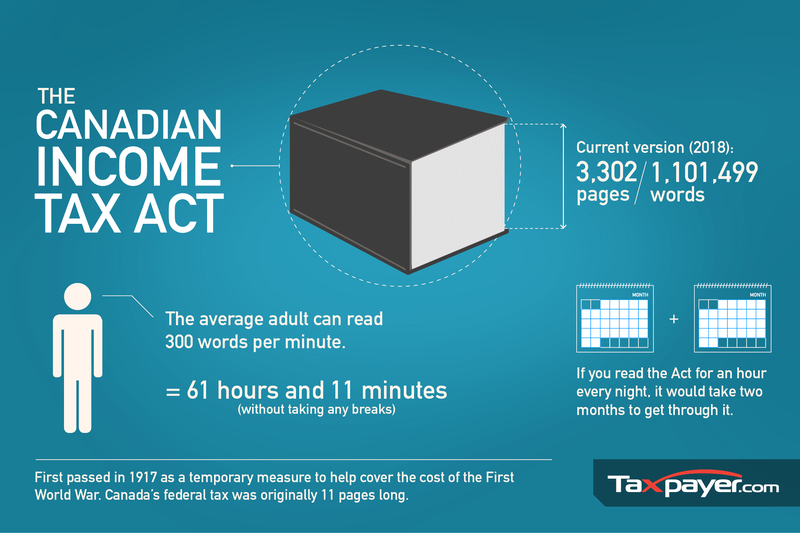 If we assume the average Canadian can read 300 words a minute, it would take him or her 61 hours and 11 minutes to binge-read our tax Bible. The CTF doesn’t say whether there would be a test at the end. I hope not. My experience of reading bits of the Act is that they are hard to understand. My tax experience in general does not augur well for comprehension: I have a PhD in economics and am generally pretty good at text comprehension, but even so, when I was filling out my taxes myself—my accountant-spouse now does them for me—there were almost as many years I wouldn’t get the final numbers right as years I would. (Though I’m not a very mathematical economist, the errors were generally not arithmetic but rather because I’d accidentally left something out or included something wrongly). Mr. Wudrick notes that the original Income War Tax Act in 1917 was only 11 pages long, which means it has lengthened by almost 33 pages a year since then. On average, it has grown by almost six per cent a year. If we’d had six per cent real economic growth in Canada since 1961, let alone 1917, our real GDP would be more than four times higher than it is. That we don’t have higher real GDP almost certainly has something to do with our metastasizing income tax system. Last year the Fraser Institute published the History and Development of the Personal Income Tax: Zero to 50 in 100 Years, authored by yours truly and Jason Clemens, the institute’s executive director. In it we reproduced the form Canadians who were eligible for the first income tax had to fill out. (Only about two per cent were.) It had a total of 34 lines, only 23 of which the taxpayer completed. The tax department did the rest, which included final netting of income against deductions and calculation of income owing. It wasn’t a painless experience—taxpayers were being separated from their money—but it looks much more streamlined than today’s tax forms, of which there are now dozens, if not hundreds. We have to cut the tax people at least a little slack. If you run a tax system for 100 years, lots of questions and puzzles are bound to come up, and developing rules for handling them inevitably will require extra words and pages in the Act. There’s not much way around that. 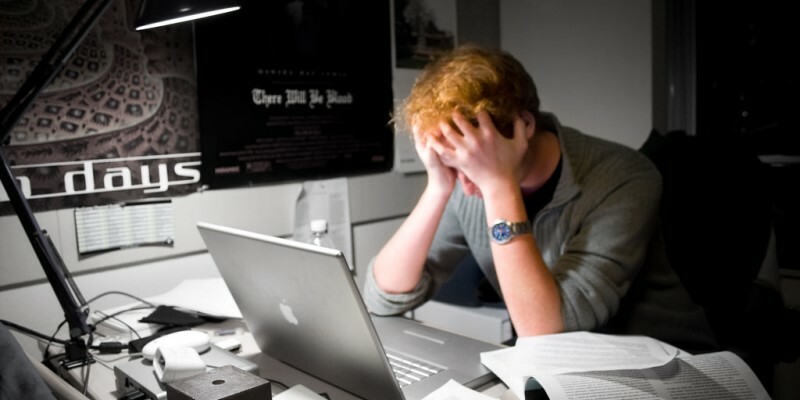 There’s also the fact that with computers doing a lot of the work these days, things can be more complicated. Processes no longer have to be targeted at average Canadians sitting with pencil and scratch pad at their kitchen tables. It’s a pity more people don’t do their taxes the old-fashioned way, but once that boundary has been crossed and most taxpayers are using computer packages or professional help, the marginal cost of the extra complication falls. Once those who program the tax packages have taken a new wrinkle into account, its cost in terms of the extra computing required is probably effectively zero. But the fact remains that much of the complication in the Act is due to two things. First, high marginal tax rates, which create an incentive for people to find ways around rules that then must be rewritten in much greater detail to make them more watertight. And, second, tax-based economic and social policy, which usually operates by privileging certain kinds of income or expense, thus creating an incentive for people to try to have their own income or expense reclassified in the way that taxes it least, which then requires a rewriting of the rules, again in much greater detail, to prevent this kind of circumvention. As taxpayers then respond to the rewritten rules in new and imaginative ways, they have to be rewritten again, which leads to yet more tax creativity, and so on and so on in a never-ending death spiral of new Act words and pages. An income tax that was applied at the same low rate for all types of income would reduce the incentive for tax-minimizing end-runs around the rules, and could slow—and maybe even reverse—the growth of the Act. There’s little doubt that, except for tax lawyers, all Canadians would benefit from that.